The state of Minnesota will send rising sophomore (2016) Amir Coffey and the “Big Three” (2014) of Tyus Jones, Reid Travis and Rashad Vaughn. Coffey suffered a leg fracture in July and is not expected to fully participate, but does plan to attend camp. In addition, (2015) Henry Ellenson of Rice Lake, Wisc. and the D1 Minnesota program will be in attendance. 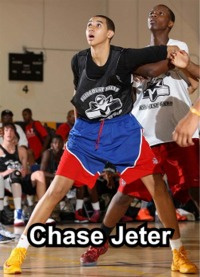 Newly added DNT member 2015 Chase Jeter is a 6’10” forward from Las Vegas and a target of the Minnesota Golden Gophers. Head coach Richard Pitino was in Las Vegas last week to watch him and fellow 2015 big man Stephen Zimmerman. While both kids are elite talents and play for the same high school (Bishop Gorman) and travel program (Dream Vision; Zimmerman played 17U and Jeter played 16U this summer), their relationship is strong and they appear more concerned with helping each other improve as opposed to grabbing the spotlight. Mother was born and raised in Minnesota. Father played for UNLV and teamed with their current head coach Dave Rice on the 1990 national champion team. Played with Dream Vision 16U this summer. LNH saw them several times in person this year, including against D1 Minnesota (Ellenson) in Las Vegas. Continues to grow and put on weight/muscle. Upside is considerable. Young for grade – the high school junior will turn 16 later this week. Versatile weapon who will be need to be utilized offensively in college. Coach Pitino and his staff will need to sell Jeter on how they could use him in a fast-paced offense. By all accounts he’s a well-grounded, self-disciplined kid whether it’s on the court, with the weights and in the classroom. Late Night Hoops is on Twitter.